Each spring, the department recognizes two senior Religion majors with an "Outstanding Student Award." The award is based upon student GPA. 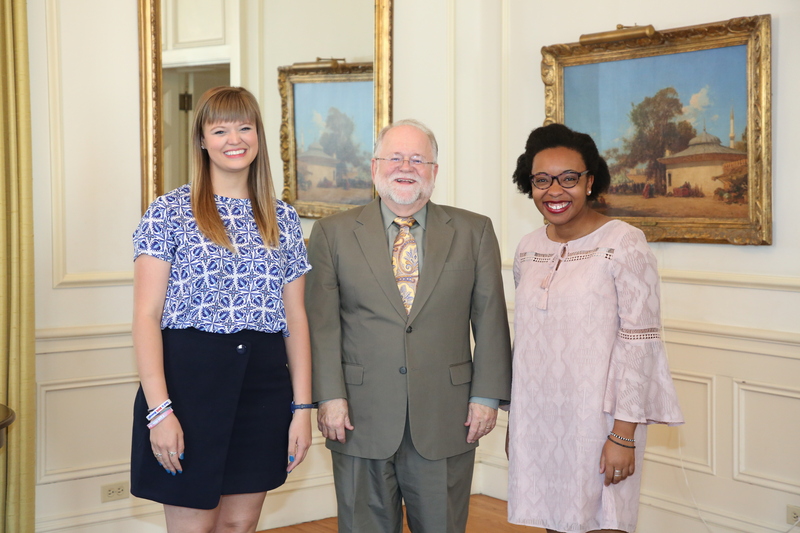 The recipients for the 2017-2018 academic year were Leah Reed and Anne-Marie Berg. Below are profiles of our two recipients. Here they are pictured with Dr. Bellinger. Leah graduated from Baylor in May 2018 with a B.A. in Religion and minors in Sociology and Poverty Studies & Social Justice. She was a member of the Phi Beta Kappa honor society. While at Baylor, Leah interned with Calvary Baptist Church of Waco and Texas Hunger Initiative, a nonprofit research initiative within the Garland School of Social Work that is fighting food insecurity and hunger in Texas. She also served as a leadership team member at University Baptist Church, her home church in Waco. Leah will begin working toward her Master of Divinity at Duke Divinity School in Fall 2018. She hopes to eventually work in either hospital chaplaincy or congregational pastoral ministry. Anne-Marie Berg will graduate from Baylor in December of 2018 with a Bachelor of Arts degree majoring in Religion and minoring in Leadership Studies. She has earned a place on the Dean's List every semester at Baylor, and is a member of the youth ministry staff at First United Methodist Waco. Above all, Anne-Marie is grateful to both the Religion Department and the Ministry Guidance program for providing academic challenges and spiritual formation, as well as their continual display of unfailing generosity. After graduation, Anne-Marie hopes to pursue a Master of Divinity at seminary and live out her calling as an ordained minister.